The Mustard Pot was built in 1760. It was the home of Mr & Mrs Taylor and was one of two toll cottages situated in the village of Mendlesham, where they had lived for 13 years. It measured only 20ft square. 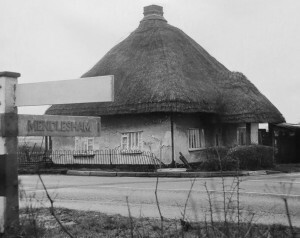 In 1971, the two cottages were required to be demolished, to make way for the widening of the A140. The Mustard Pot, being the most unusual of the two, was donated to Mr Sniechowski of Ipswich for future preservation at Needham Market who had become very attached to the cottage and had agreed to pay the transportation costs. In May 1972, after six weeks of preparation, the roof was finally lifted by a 35 ton crane and placed onto a 40ft trailer. 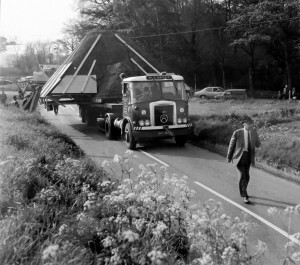 It cost £2,000 to move, needed 22 workmen and could only travel at 10mph on the narrow country lanes – a journey that took six hours. The walls of the cottage were dismantled and re-erected within two months. Mr Sniechowski had intended for the cottage to be used as a fisherman’s hut to coincide with the development of Needham Lake, but sadly he died within a few years and The Mustard Pot stood empty. 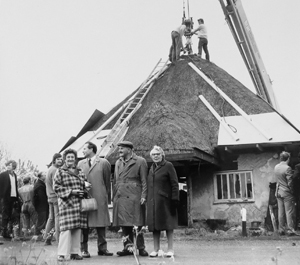 In 1982, Mrs Sniechowski eventually received permission for The Mustard Pot to be used as a dwelling, for a five year term. Fortunately, during this period, Mid Suffolk District Council gave in to an appeal by Mrs Sniechowski to extend the term. The council considered that the history and circumstances surrounding The Mustard Pot made it unique and it would be unfair to let the building fall into disrepair. It was now an important part of British Heritage and should be preserved and maintained. Stowe Veterinary Group purchased the building and, in 1986 added an extension to give sufficient extra space for The Mustard Pot to be used as a veterinary surgery for the residents of Needham Market and the surrounding villages. Initially, newly graduated veterinary surgeons would utilise the cottage for their accommodation and many have fond memories of those early days living at The Mustard Pot. However, within a few years, the client base had grown to such an extent that more surgery space was needed and so the bedroom and lounge were converted to provide a new larger waiting room and a reception area. The Mustard Pot is part of our British Heritage and will continue to be preserved and maintained by us. This picturesque veterinary surgery appears on postcards in local shops and is now a well recognised visitor attraction in the small rural town.